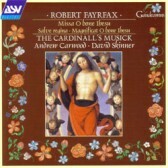 The Missa O bone Jesu is the most meditative of Fayrfax’s masses. On this fourth volume of the series it is paired with a Magnificat setting of the same name. Fayrfax obviously used a model entitled O bone Jesu as the starting point for both of these compositions but unfortunately this antiphon no longer survives. Completing this disc are three more exquisite secular songs and an early setting of the Salve regina.